On Tom Trento’s radio program in February 2013 , UTT’s President John Guandolo detailed that former Director of Central Intelligence John Brennan publicly said the Islamic statement of faith (shahada) in the presence of government officials and intelligence agents from the Kingdom of Saudi Arabia in Saudi Arabia while he was the CIA’s Station Chief there. The source of Mr. Guandolo’s comments were U.S. government officials – who are still in government service – who were in Saudi Arabia at the time. These comments were roundly criticized by left-wing media outlets and continue to be used as a talking points by the terrorist group Hamas, doing business as the Council on American Islamic Relations (CAIR). 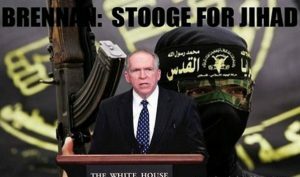 Last week, former CIA Station Chief Brad Johnson publicly confirmed that several people inside the CIA made him aware that John Brennan converted to Islam. See the 1 1/2 minute video HERE. Once again, UTT was ahead of every other source of news and information when it comes to the Islamic threat. UTT continues to take the fight to the enemy and put freedom back on the offensive where it belongs.